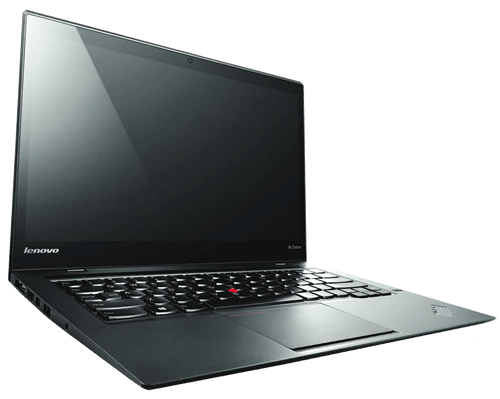 Have you seen the 4th generation Lenovo Thinkpad X1 Carbon laptop? If not, then today is your lucky day because that’s what I want to talk to you about it in the event you’re looking at picking up a second-hand laptop. This is a light, portable business class laptop like the HP Elitebook 840 G3. It’s aimed at professionals and enterprise users. Every year Lenovo had to compromise some sort of features like its battery life or keyboard in order to keep the Carbon light and portable. The good news is back in 2016, they were able to do everything with zero drawbacks. When you first look at this laptop you can’t help but notice that’s it’s extremely well-built. It’s made out of satellite-grade carbon fiber that screams classy, durable and ready to do business. 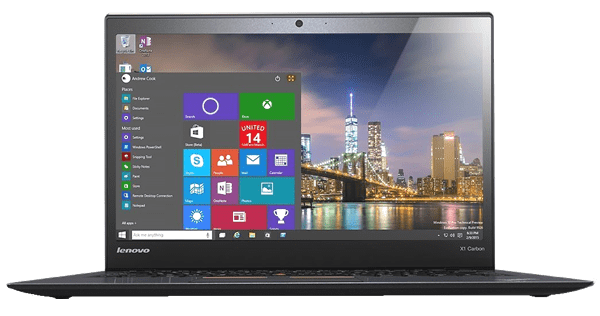 Lenovo actually tested this laptop against the elements. It’s spill-proof and they even placed a roll cage inside that you’d find in a car in order to protect the internals from damage. The X1 is built like a tank to withstand rough use while keeping a light and thin profile. At only 2.6-pounds it is sometimes hard to tell that you are even carrying your laptop inside your backpack. In terms of ports, on the left side, there’s a power connector, Lenovo’s OneLink+ docking port, a mini DisplayPort, and a USB 3.0. On the left, you have an HDMI port, two more USB 3.0 ports, and an audio jack. On the back, under a cover lies a microSD card slot and a SIM tray. 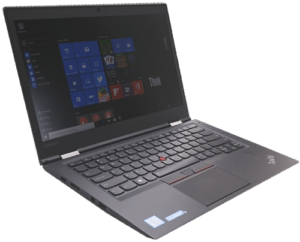 The X1 can be configured with up to 16GB of RAM, 1TB NVME SSD and a QHD display, but can also be configured with a 1080p display if that’s what floats your boat. The one I have here is the 1080p with a 6 generation Intel i5 vPro processor. Those unfamiliar it provides hardware-enhanced security that Enterprise requires. It also has 8GB of RAM and a 256GB SSD and retails for about $1,250.00 USD. Now, there’s no Ethernet port which isn’t a big deal, but there’s no full-size SD card reader, and that’s a drag. I was really hoping that they would at least include one USB-C port since that is becoming the new standard. The 14″ Full-HD display on the X1 Carbon is really good. The colors are vibrant, the text is sharp, and the viewing angles are great. It produces over 100% of the sRGB color gamut, which is much higher than other competing brands like the Dell XPS and the MacBook Air. My biggest complaint is that the screen is a bit darker than I prefer. This display does not support touch gestures and that includes the QHD model, but the awesome side to that is that it does have a matte finish screen and that drastically cuts down on the amount of glare. Above the display is an HD webcam. it’s fine for video conferencing. The colors are a bit muted, but most people probably won’t care too much. When it comes to the keyboard it’s really done well. It’s one of the best keyboards I’ve tested in a while. 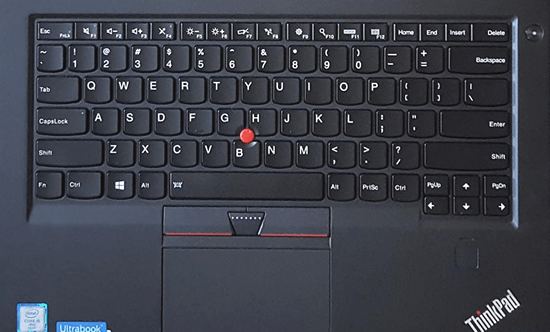 The trademark U shape Lenovo keys feel great, they’re tactile, not mushy and have a comfortable travel of 1.8mm. The entire keyboard is spill-proof and has three levels of backlighting that can be adjusted tapping the function key and spacebar to your desired brightness. The building design of this notebook makes sense. 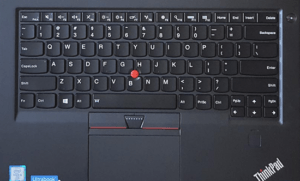 Below the arrow key is a fingerprint scanner which allows you to log in to Windows Hello or pre-boot authentication. For you olde-schoolers out there, it still has a pointer stick in the middle of the keyboard that feels accurate and nice to the touch. If the pointer stick isn’t your gig, there’s a really decent glass trackpad just below the keyboard. It’s comparable to the Dell XPS 15’s touchpad. For me it’s probably up in the top 5 PC laptop touchpads. 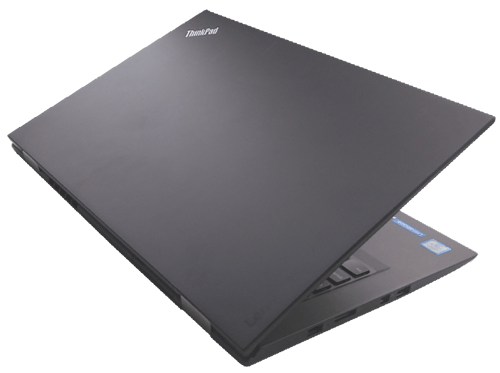 Multi-finger gestures, pinch-to-zoom, and clicking all work accurately, overall, this is a solid touchpad and keyboard. In order to keep that clean black look, they had to put the speakers on the bottom. As I’ve commented many times in the past. that’s not my favorite location because speakers tend to sound fairly tinny when on a desktop or table. However, the end-all product is good. 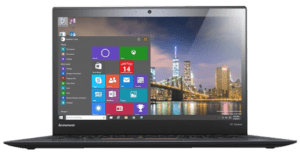 They are not as loud as you can find on the Dell XPS 12, but they do get loud enough to fill up a small room to listen to presentations or watch streaming content. It still comes with Dolby audio software that allows you to change the presets depending on what you are listening to. 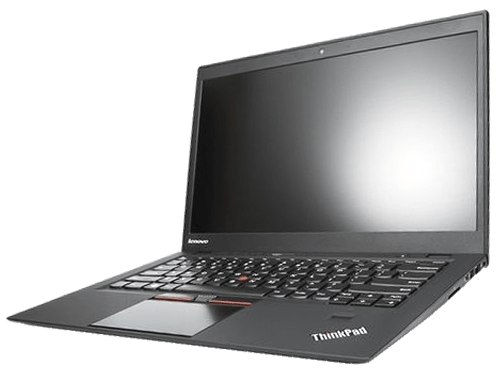 Performance is key and the X1 is a strong performer when it comes to productivity tasks and multimedia. Feel free to keep about 15 tabs open and play full-HD video without any problems. Light photo editing runs fine and any work inside of Microsoft Office or Google Docs will run well. At the end of the day, this is first a business machine, so don’t expect to play any newer game titles on it. If you pay attention you will notice that the fans do power on fairly easily even when running light functions like browsing the internet. While the Lenovo X1 Carbon can be configured with a SATA or PCIe NVME SSD, this one is I’m talking about came with the NVME SSD, and its read and write speeds are insanely fast. Inside it houses a Samsung P95 drive that kicks out read/write speeds at 2124 MB/s and 1257 MB/s respectively. If you rely on a very fast drive, you won’t be disappointed. With all of that fan noise, it’s safe to say that the X1 Carbon does a great job of handling the heat. Under a full load just above the keyboard on the keyboard deck, it reads 100-105F. Last up is the battery. And inside is a 4-cell battery that is good enough to get you through an entire day. With the brightness set to about 75%, I was able to get just about 8 hours of use on average. If you drop that screening level to under 50% you should get over 9 hours. The battery life is really good. If you have the QHD model you should expect those numbers to drop a bit.